The weather has finally turned around here in Toronto and with the nice weather comes the festival season of great shows happening in the city. 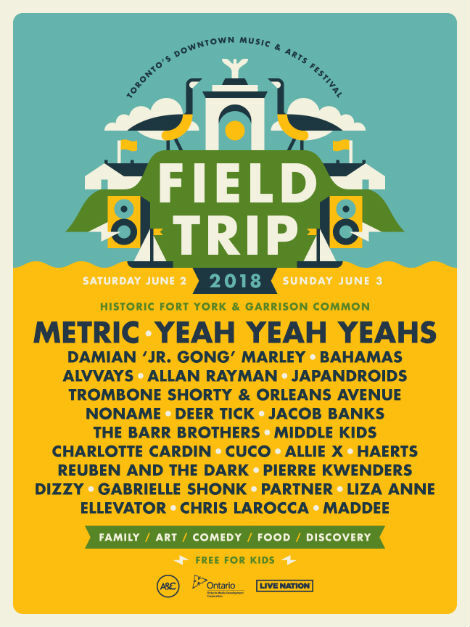 One of my yearly favourites is Field Trip, taking place next weekend (June 2nd/3rd) at Fort York. This years’ lineup features Metric, Yeah Yeah Yeahs, Alvvays, Japandroids, and Haerts to name a few (full lineup here); always a great place to discover a new band. In case you haven’t picked up your ticket yet, take a chance here on winning a pair of GA weekend tickets to the festival. Check the widget below to enter. You can retweet a tweet on twitter, or answer a question to enter (one entry per person). I’ll pick a winner this Tues at Noon (EST).